Muscular dystrophy: how could stem cells help? Muscular dystrophy is a muscle wasting disease that has many different forms. About 1 in every 3,500 boys worldwide is born with the most common form of the disease, Duchenne muscular dystrophy. How might stem cell research lead to new treatments? Muscular dystrophies are a group of genetic diseases causing weakness and progressive decline of heart and skeletal muscles. People with Duchenne muscular dystrophy (DMD), lack a protein called dystrophin, which makes their muscles easily damaged. Muscle damage may lead to inflammation that causes further damage to muscle tissue. Normally, muscle stem cells, called ‘satellite cells’, create myoblast cells that repair damaged muscle fibres. However, satellite cells in DMD patients struggle to make enough myoblasts and quickly become depleted. Researchers are investigating many details about satellite cells and the causes of muscle damage as well as treatments that help reduce muscle damage, such as anti-inflammatory treatments. Studies are examining ways to preserve, and possibly restore, muscle function by transplanting dystrophin-producing cells into patients. These cells could be healthy donor cells or a patient’s own cells that have been genetically modified. Induced pluripotent stem cells (iPSCs) are being studied as an option for making large numbers of cells with healthy dystrophin genes. One major challenge for treatments using donor cell transplants is the potential for transplant rejection by a patient’s immune system. Treating patients with their own cells (either genetically modified cells or iPSCs) can largely overcome transplant rejection but have other risks. Another major challenge is engraftment: most muscles in a patient are weakened and need treatment. Evenly distributing cells to muscles throughout the body is a big challenge for cell therapy treatment. Currently cell therapies also have a relatively low success rate because of the unavoidably low ratio between healthy (or genetically corrected) cells versus resident diseased cells. How is muscle damage normally repaired? Why doesn’t muscle repair itself in DMD? How is DMD currently treated? How could stem cells help? Can muscular dystrophy be treated with stem cells now? Muscular dystrophies are a group of genetic diseases that affect skeletal muscles and often also heart muscle. The symptoms include muscle weakness and progressive muscle wasting. Duchenne muscular dystrophy (DMD) is the most common and a very severe form of the disease. It is caused by a genetic fault which prevents the production of a protein called dystrophin. Without dystrophin, muscles are fragile and are easily damaged. Over time so much damage builds up that the body can’t repair it and muscles waste away, causing progressive disability in patients. The majority of a muscle is formed from bundles of muscle fibres, long cells containing many nuclei; but muscles also contain many other types of cells, including stem cells. Stem cells are part of the body’s inbuilt repair system. They can generate progenitor cells and also make copies of themselves. Skeletal muscles contain a type of stem cell called satellite cells. When muscle fibres are damaged they send chemical signals to satellite cells telling them to form new muscle fibres or to fuse with existing fibres to repair the damage. At the same time some satellite cells copy themselves to ensure enough stem cells are available to continue to repair and replace muscle fibres in the future. Scientists believe that because the muscles are constantly damaged in DMD the repair burden placed on satellite cells is so big that they become exhausted and lose their ability to copy themselves. Satellite cells are essential for muscle repair so as the number of these cells decreases, the muscle becomes less and less able to repair itself. Instead damaged muscle fibres are replaced by fat cells and scar tissue, weakening the muscle until it can no longer work effectively. Currently there is no definitive cure for DMD. Treatments aim to strengthen patients’ muscles and reduce some of the symptoms of the disease. Steroids are routinely used to slow down muscle wasting but they have many side effects, including weakening of bones leading to osteoporosis, hypertension and delayed growth. Physiotherapy may partially help to maintain muscle strength and flexibility. Researchers are hoping that, in the future, they may be able to repair or replace damaged muscle fibres using different strategies, including transplantation of dystrophin-producing cells to restore or at least preserve muscle function. Producing healthy muscle fibres: Scientists hope that, if stem cells without the genetic defect that causes DMD can be delivered to patients’ muscles, they may generate working muscle fibres to replace the patient’s damaged ones. Reducing inflammation: In muscular dystrophy damaged muscles become very inflamed. This inflammation speeds up muscle degeneration. Scientists believe certain types of stem cells may release chemicals that reduce inflammation, slowing the progress of the disease. Beside stem cells, other therapeutic strategies such as gene therapy or small-molecule drugs for repairing the damaged gene are being tested in patients and in pre-clinical models. Future therapies are likely to use a combination of more than one of these approaches. Scientists are also studying the role of stem cells in the maintenance and repair of healthy muscles in order to understand in more detail what goes wrong in muscular dystrophy and how the problem could be corrected. Much current research is focussed on developing ways to restore production of the missing protein dystrophin in the muscles of DMD patients. Myoblasts are a type of cell formed from satellite cells after birth. Myoblasts fuse together to form muscle fibres. When injected into the muscles of mice with muscle damage similar to that caused by DMD, myoblasts from healthy donor mice fuse with the diseased muscle fibres and partially restore dystrophin production. However, clinical trials have shown that myoblast transplants are not effective to treat very large muscles in humans. Only a few of the transplanted myoblasts survive when injected into dystrophic muscles and, if derived from a donor, are attacked by the body’s immune and inflammatory cells, causing rejection. There are also practical problems: although myoblasts may eventually be useful as part of treatments for types of muscular dystrophy that affect only a small and specific area of muscle in the body (as recently shown for oculo-pharynegeal muscular dystrohpy, OPMD), DMD affects most of the body’s muscles. This makes it extremely challenging to treat with intra-muscular injections as the cells do not move away from the injections site, thus many thousands of injections would be necessary. Obtaining the large numbers of cells that would be needed for transplantation and then delivering these cells to all the muscles in the body would be extremely challenging. Alternatively, to treat every muscle, the cells would need to be injected into the bloodstream to be carried around the body. Myoblasts cannot be delivered in this way because they cannot pass across blood vessel walls and so cannot travel from the blood to surrounding muscles. Mesoangioblasts (MABs) are a type of 'progenitor' cell. MABs are found in the walls of blood vessels. Researchers have shown that healthy mesoangioblast cells can form dystrophin-producing muscle fibres in both dogs and mice with muscular dystrophy. The extent to which this formation of new fibres reversed muscle wasting varied between individual animals. Importantly, MABs can cross blood vessel walls so they can be delivered to all muscles in the body by injecting them into the arterial blood stream. iPS cells can be made in the lab from virtually any cell of the body and are pluripotent – this means they can make any cell of the body. Recently researchers discovered how to turn iPS cells, originally grown from patients’ skin cells, into cells that behave like healthy MABs. When these MAB-like cells were injected into mice with muscular dystrophy the mice gained muscle strength, could exercise for longer and produced normal muscle proteins. This was a very early study and a lot of research is still needed to establish whether this type of treatment would be safe and effective in humans. However, this research does suggest that MAB-like cells grown from iPS cells may be promising as a way to treat different types of muscular dystrophy. Since iPS cells can copy themselves indefinitely, an unlimited number of MAB-like cells could potentially be grown from a patient’s own skin cells and delivered in the bloodstream. These cells would be easier to grow in the lab and might be less likely to be rejected by the patient’s immune system than donor cells. Possible route to cell therapy for muscular dystrophy: Mesoangioblast (MAB)-like cells can be made from iPS cells. The MAB-like cells were transplanted into mice in a recent study, with some positive results. More research is needed to find out whether the strategy could lead to treatments for patients. Researchers are investigating alternative anti-inflammatory or muscle growth promoting drugs to treat muscular dystrophy. Many clinical trials are currently running with large numbers of molecules but conclusive results are not available at this time. Some new molecules such as PTC124 (that works to repair the gene defect) got market authorization in Europe but, again, results are non-conclusive. A similar situation holds for small molecules (oligonucleotides) that cause the cell machinery to skip the mutation that prevents synthesis of dystrophin (exon skipping). Overcoming the low engraftment of transplanted cells. With bone marrow transplantation, for example, the disease cells are removed. In DMD the diseased muscle cannot be removed and so transplanted cells lack "space" to engraft. This factsheet was created by Rachel Gill. Edited by Jan Barfoot. Reviewed in 2013, 2016 and 2018 by Giulio Cossu. 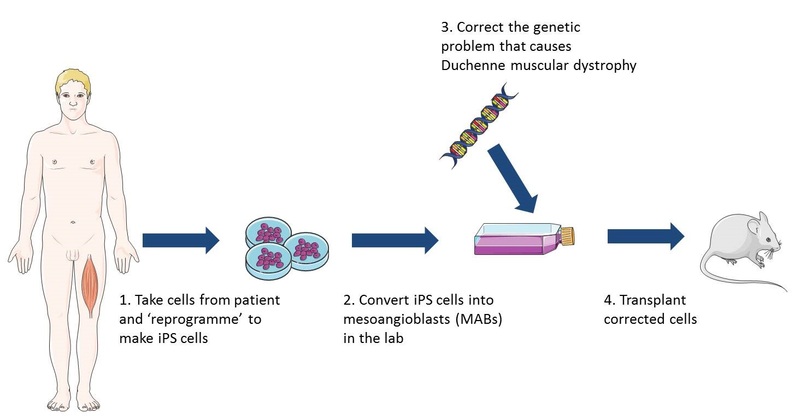 Lead image of muscle structure and diagram illustrating the use of iPS cells in research on cell therapy for muscular dystrophy produced by Emma Kemp using Servier Medical Art. Image of muscle from a Duchenne muscular dystrophy patient by Dr. Edwin P. Ewing, Jr and courtesy of the Public Health Image Libraryof the US Department of Health and Human Services. Muscle fibre photograph by Mike Kayser, Wellcome Images. Muscle fibres grown from mesoangioblasts courtesy of OptiStem and by Giulio Cossu. The faulty gene in Duchenne muscular dystrophy is called dystrophin; it is the largest gene in the human body and was discovered in 1986. The cell (fibre) contains numerous 'myofibrils', seen here as groups of regularly arranged small dark dots.